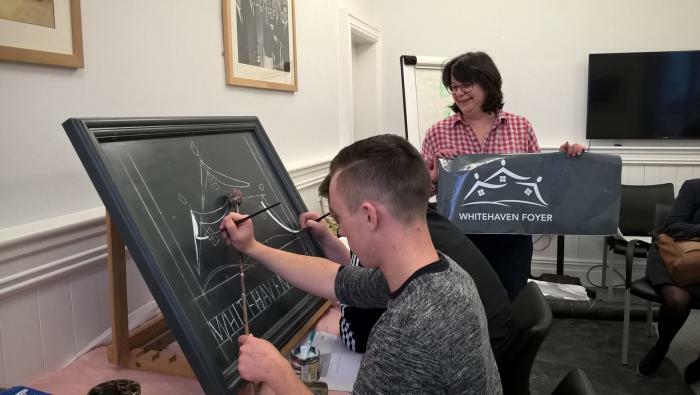 Five people took part in a day-long course led by Davina Halliday, member of The Guild of Master Craftsmen. Their efforts resulted in a sign that will adorn the outside of the Foyer building on Irish Street. The course was part of the Whitehaven Townscape Heritage Initiative, which has funded the sympathetic refurbishment of residential and retail properties in Market Place and James Street, and training for local builders in heritage construction techniques. There have also been several courses for the public in traditional skills. The participants learned how to construct individual letters, map out signs and create the traditional imagery associated with sign-writing. The Whitehaven Foyer building is one of the THI's biggest renovations. It now houses supported living for young people to live, learn and make the transition to independent adulthood. Ms Halliday said: "It was wonderful to work with the young folk and they have some extraordinary talents. I hope and wish that they all do really well in the future and that they always have dreams to fulfil." Mayor Mike Starkie said: "As the THI scheme draws to a close it's wonderful to see these traditional techniques embedding in our communities. These young people have learned something invaluable and I commend them for getting involved in the heritage of their town and their own building. It will be fantastic to see the finished signs adorning the side of this important building." Whitehaven's Townscape Heritage Initiative is funded by the Heritage Lottery Fund (£660,000); Britain’s Energy Coast (a legacy project using funding from the Nuclear Decommissioning Authority) (£395,000) Copeland Borough Council (£250,000) and the Copeland Area Committee of Cumbria County Council (£50,000).